BROKEN RIVER VIADUCT. The length of this structure is 441 ft, and the track is carried 130 ft above the water. It is on the Trans-Alpine Railway between Christchurch and Westland, South Island, New Zealand. NO less interesting than the railways of the North Island of New Zealand are those in the South Island. The mountain backbone of the South Island reaches considerably higher altitudes than any of the mountain ranges in the North Island. As compared with the latter’s highest peak - Ruapehu, with an altitude of 9,175 ft - Mount Cook in the South Island towers to 12,349 ft above the sea. The west coast, with its deep inlets and ice-mantled peaks, gives a combination of Norwegian and Alpine scenery that probably has no rival in the world, especially as many of the mountains in the Southern Alps of New Zealand can be seen in all the majesty of their full height from the level of the sea itself. A casual reference to the map might lead the observer to the conclusion that the obvious connexion between the North and South Islands of New Zealand is across the narrow width of the Cook Strait, from Wellington across to Picton. A steamer service is certainly maintained across this often rough stretch of water, and a railway is found on the south side of the strait. But it travels only as far as Wharanui, down the east coast. Then comes a stretch of very difficult country, from the engineering point of view, where the Kaikoura ranges strike out to the coast. This region also is so sparsely populated as to offer little inducement for railway building. At present, therefore, there is a gap of eighty-two miles along the east coast until Parnassus, the most northerly point on the main railways system of the South Island, is reached. So the traveller from Wellington to Christchurch embarks on one of the fine steamers maintained by the railway administration, of which the biggest is of 6,000 tons register. He sleeps comfortably on board, and is taken from one capital to the other - or, strictly, to Lyttelton, the port of Christchurch - in eleven hours, the distance covered being 174 miles. The journey is thus completed overnight; nine hundred passengers can be berthed on one of the vessels. A dramatic introduction to the South Island is obtained on this voyage. The rocky gates through which the steamer passes into Lyttelton Harbour are really the opening of an ancient volcanic crater, and the bills that encircle the harbour, with their ramparts of rock at various points dropping sheer down to the water, are largely composed of lava. It is through a precipitous rhyolite lava range that the train makes its Way by tunnel out of Lyttelton. 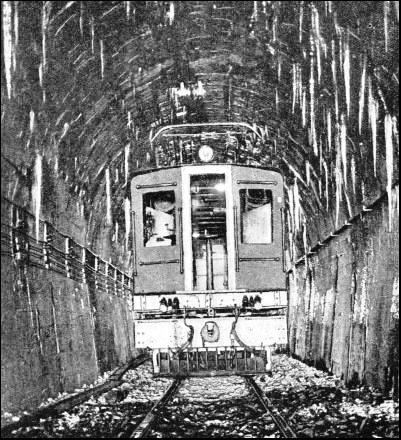 The tunnel, 2,860 yards in length, was the longest in the Dominion until the opening of Otira Tunnel. Yet Lyttelton Tunnel formed a part of the first railway to be laid in New Zealand. THE FIRST RAILWAY in New Zealand was opened in December, 1863. The line, nearly three miles in length, ran from Christchurch towards Lyttelton. To-day, as shown on the map, all the main towns are served by the railway. The gauge is 3 ft 6-in. Lyttelton Tunnel, indeed, was a tremendous problem. The settlement was less than twenty years old when the railway was decided on in the ‘sixties, and the tunnel alone cost £195,000. Each province in those days had its own parliament and its own system of finances; and it fell to the Canterbury Provincial Government to find the money for the scheme. The engineer and chief surveyor of the province was entrusted with the engineering of the line - tunnel included - and carried it through to a successful conclusion in the year 1867. This first railway in New Zealand had a gauge of 5 ft 3-in, decided on by the Canterbury Provincial Government for its lines, to agree with the gauges of South Australia and Victoria. But when the Federal Government of New Zealand took over the railways in both islands, standardization was essential, and 3 ft 6-in was the standard settled on. The present gauge in the South Island, therefore, is but two-thirds the width of that which was first laid. The old broad gauge stock was sold, after the change of gauge, to the South Australian Railways, but on the way from New Zealand much of it was lost at sea in the wreck of the ship Hyderabad on Otaki beach. It was in December, 1863, that the first railway track in New Zealand came into use. This was a line just under three miles long from Christchurch, in the direction of Lyttelton. The work of boring Lyttelton Tunnel held up the next three and a half miles, which were not opened until four years later. By that time an extension southwards from Christchurch, forming a part of the present main line to Dunedin, had come into use. But again one of Nature’s obstacles lay athwart the path of the engineers, and held up further extension for nearly six years. This was the width of the Rakaia River, which for more than a mile had to be bridged. The history of railway construction in the South Island is largely bound up with the crossing of rivers. Sweeping across the eastern plains from the western mountain chain, these great streams, fed by water from glaciers, had to be spanned one by one. It was width rather than depth that troubled the engineers in making their structures. Rakaia Viaduct, the longest in the whole of New Zealand, has a total length of 5,966 yards. By June, 1873. it had been brought into use, and construction then proceeded more rapidly. A “K” CLASS LOCOMOTIVE. Thirty of these powerful 4-8-4 engines are operating in New Zealand. Their cylinders measure 20-in by 26-in. They have a tractive effort of 30,815 lb at 80 per cent of the working pressure. The coupled wheels are 4 ft 6-in, and the total weight with tender is 135½ tons. Over buffers, engine and tender measure 70 ft. Meanwhile work had been proceeding much farther to the south. A railway was opened in February, 1867, from Invercargill to Bluff - New Zealand’s most southerly port - thus antedating the completion of the line from Christchurch to Lyttelton by a mere nine months. Then, in 1872, construction began from the, city of Dunedin, and the first seven miles of railway northwards towards Christchurch were opened in December of that year. 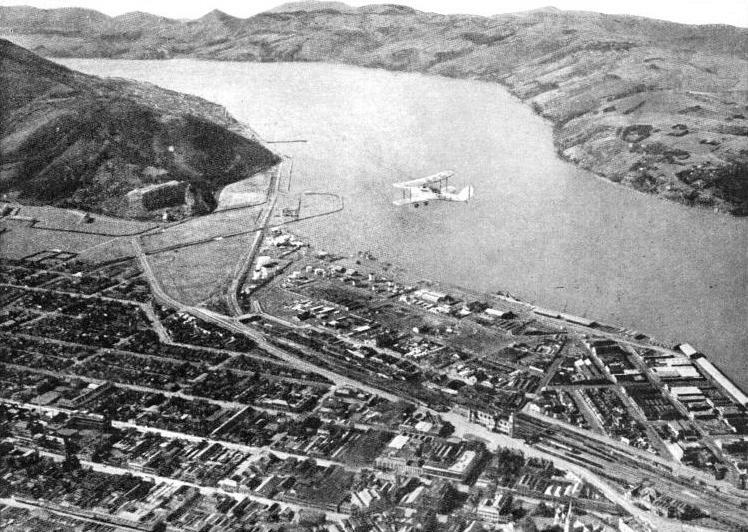 This was a small line connecting Dunedin with Port Chalmers, on which double-ended “Fairlie” locomotives were used. But the bulk of the constructional work on the main line was carried out between the years 1875 and 1878. September, 1878, saw the completion of the last link between Christchurch and Dunedin - the nine miles from Palmerston to Waikouaiti, and the final link south of Dunedin - the twenty-one miles from Balclutha to Clinton - followed in January, 1879. Thus the whole of the South Island’s main line, 392 miles in length, from Lyttelton through Christchurch, Palmerston, Dunedin, and Invercargill to the Bluff, became an accomplished fact. Of other river crossings, the biggest, after the Rakaia Viaduct, is the bridge across the Waitaki River, near Oamaru, 3,733 ft long. The two arms of the Rangitaka River also required some extensive bridging, with one viaduct 1,978 ft and the other 1,016 ft long. For the first 130 miles out of Christchurch the line is level. One by one the waters of the great rivers are crossed - the Rakaia, Ashburton, Rangitaka rivers in particular - rushing down their wide beds from the glaciers which cover the Southern Alps, fifty or sixty miles to the west. The whole of the great Canterbury Plain was formed, in the remote ages of the past, by erosion from the mountains, the sandstone and slate formation of which made them subject to denudation on a vast scale. These deposits now form a most important part of New Zealand’s natural wealth, for here is the finest granary and sheep-farming district in the Dominion. Beyond the broad Rangitaka comes the South Canterbury country, which extends for sixty miles southwards to the Waitaki River, separating it from Otago Province. The plain gives place to hilly country coming down to the sea, and from Timaru onwards the railway hugs the coast as far as Dunedin, whence a sinuous course, farther inland, is followed to Invercargill and Bluff. During its progress, the railway has thrown off many branches inland, up the rivers towards the mountains. It was one of these, in the valley of the Waimakariki River from Rolleston Junction, that was finally carried into the heart of the mountains at Arthur’s Pass, to pierce the ridge and link up with the lines on the western seaboard. The Otira Tunnel itself was, of course, the most costly and difficult part of the undertaking. In length it is five and a quarter miles, and it is of horseshoe shape in its cross-section, 17 ft high and 15 ft wide. It was driven from either end, first with a bottom heading, and then with a second heading at a higher level, to assist in the removal of the spoil. Stiff climbing from Rolleston Junction is needed to reach the east portal of the tunnel, which is 2,435 ft above sea-level. Through the tunnel the line falls steadily on a gradient of 1 in 33, emerging at Otira, 1,585 ft above the sea. The tunnel is dead straight, and it is possible from one end to see the pinpoint of light which marks the other end. THE LONGEST RAILWAY TUNNEL in the British Empire is the Otira Tunnel in the South Island of New Zealand. This tunnel is about five and a quarter miles long and is 17 ft high and 15 ft wide. The tunnel is dead straight, but the single line through it has a gradient of 1 in 33. Because of ventilation difficulties the track through the tunnel has been electrified. Because of the fact that the tunnel has only a single track, and exceptional steepness of gradient, it was apparent that considerable difficulties in ventilation would be experienced if any attempt were made to use steam traction through it. Overhead electrification has therefore been installed. At both entrances the steam locomotives are detached from the trains, and electric locomotives substituted. Electric light signalling is also used on the tunnel section. Including the connecting lines and the electrification, which extends over a distance of nine miles in all, the railway administration spent the large sum of £1,500,000 on this scheme; but the vast improvement in the South Island communications that it has effected has doubtless justified the expenditure. Some costly engineering work had also to be carried out on the approaches to the tunnel, especially in the mountain gorge through which the railway is carried rapidly down the short distance from Otira to the west coast. In addition to the main tunnel there are seventeen other tunnels, and three big steel viaducts, one of which carries the line 236 ft above the ravine that it spans. At Stillwater Junction the tunnel route joins the previously existing railway from Seddonville and Westport to Greymouth and Ross, and in a few miles from Stillwater the passenger is at Greymouth. Northwards from Christchurch the railway has thrown out a line as far as Parnassus, which completes a main route 471 miles in length, down the east side of the island from Parnassus in the north to Bluff in the extreme south. From Parnassus there exists the gap in communication, previously mentioned, of eighty-two miles to Wharanui. Plans have been drawn up to complete this link, but it is doubtful if the expense of construction would be justified in present circumstances, and at the time of writing the scheme is shelved. In the locomotive department New Zealand has achieved some striking developments on a gauge as narrow as 3 ft 6-in. Thirty of the magnificent new “K” class 4-8-4 locomotives are now at work in the Dominion, with a tractive effort which reaches 30,815 pounds at 80 per cent of the working pressure. With their 20-in by 26-in cylinders, 4 ft 6-in coupled wheels, 1,931 sq ft of heating surface and 482 sq ft of superheating surface, and 200 lb per sq in working pressure, these machines have a total weight of 84½ tons apiece, though built to a maximum height of only 11 ft 6-in above rail level. Eight-wheeled tenders are provided, accommodating 5,000 gallons of water and 7½ tons of coal, and bringing the weight of engine and tender together to 135½ tons. Over buffers, engine and tender measure 70 ft. By comparison with this, the first locomotives used between Lyttelton and Christchurch - diminutive 0-4-0 tanks - weighed 12¼ tons each in running trim. The “K’s” are the logical development of the previous “Ab” class “Pacifics”, which have 17-in by 26-in cylinders, 1,700 sq ft of heating surface and 180 lb per sq in working pressure, and weigh 70 tons each without tender. Before the advent of the “K” class locomotives it was often necessary to use the “Pacifics” in pairs on the heavier trains. OTAGO HARBOUR, adjoining the town of Dunedin. This photograph shows the fine sweep of rails running to the harbour. The main line between Dunedin and Christchurch is connected with the railways on the western side of the island by the mountain line through the Otira Tunnel. The fastest running in the South Island is between Christchurch and Dunedin, a journey 226 miles in length and comparatively easy from the working point of view, as 120 miles of the course are level. But the time of seven hours forty-three minutes taken by the best train affords little indication of what the engines can do when really pressed. Details were published of a run on an ordinary express during which, with a train, of thirteen coaches weighing in all 335 tons, one of the “Ab” class “Pacifics” - No. 809 - ran the 35½ miles from Rakaia to Christchurch in forty-eight minutes ten seconds. This included a slowing to ten miles an hour over the whole length of Rakaia Viaduct, which is 1⅛ miles long. Between mile-posts 35 and 10 - a distance of twenty-five miles - the engine maintained an average speed of 56.5 miles an hour, and reached a maximum of sixty-one miles an hour, a remarkable feat on a gauge of 3 ft 6-in, and with driving wheels of no greater diameter than 4 ft 6-in. Acceleration of the existing train services should prove a matter of no difficulty when the railway administration regards this as economically justifiable, Such speeding-up may take place before long, since in New Zealand, as in most other countries, motor competition is acutely felt. This is more serious, too, in its effect in the South Island than in the North Island, as the great flat area of the Canterbury Plains has proved much more suitable for the construction of motor roads than the generally mountainous country of the North Island. Further, the long, straight coast-line of the South Island, with its numerous ports and harbours, has caused transport by sea to be a more serious rival to the railways than in the North Island. 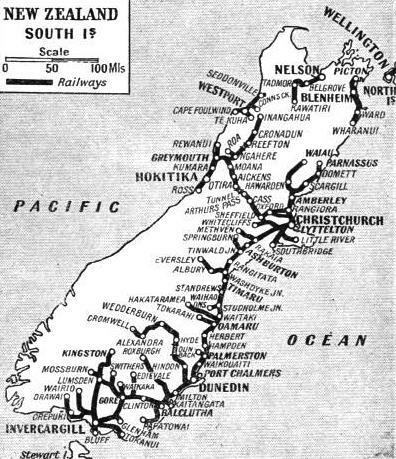 To-day the New Zealand Government owns nearly 4,000 miles of line, eighty-six miles out of the total of 3,942 miles being double track, and employs over 16,000 persons in the railway service. Main lines are laid with flat-bottomed rails weighing 70 lb to the yard, but rails of 100 lb a yard are used between Arthur’s Pass and Otira, and in Lyttelton Tunnel. Hard Jarrah wood from Western Australia is used for sleepers. There are in all no fewer than 2,472 bridges in New Zealand, comprising 10,704 spans with a total length of 354,440 ft, equivalent to 48.2 miles. Twenty-seven miles of the island system are carried in tunnels. For the whole of New Zealand, 9 per cent of the total mileage is steeper than 1 in 50, 19 per cent is steeper than 1 in 75, and one-quarter is steeper than 1 in 100. Six per cent of the total mileage is curved to a radius of 660 ft or less, and 12 per cent to a radius of 990 ft or less, while just over one-quarter of the whole mileage is curved. Both gradients and curves, of course, will for all time exercise a restraining influence on speed, as will the narrowness of the gauge; though, as we have seen, mile-a-minute travel is achieved at times on the straight sections of the line. The New Zealand Government Railways own about 650 locomotives, 1,500 coaches and over 25,000 freight vehicles. The latest types of locomotive, such as the “Ab” 4-6-2 and “K” 4-8-4 classes, have both been designed by New Zealand engineers and built in New Zealand workshops. In this, as in all other matters, a vigorous policy of development is being pursued. From modest beginnings, comparatively late in the world’s railway history, the railways of New Zealand have attained a position of first-class importance. By contrast, it is amusing to recall that in the early days of the little line from Invercargill to Bluff the first fares were fixed at the exorbitant figure of eight shillings single and twelve shillings return for a journey of only seventeen and a quarter miles, though it cost twenty shillings to cover the same distance by coach. 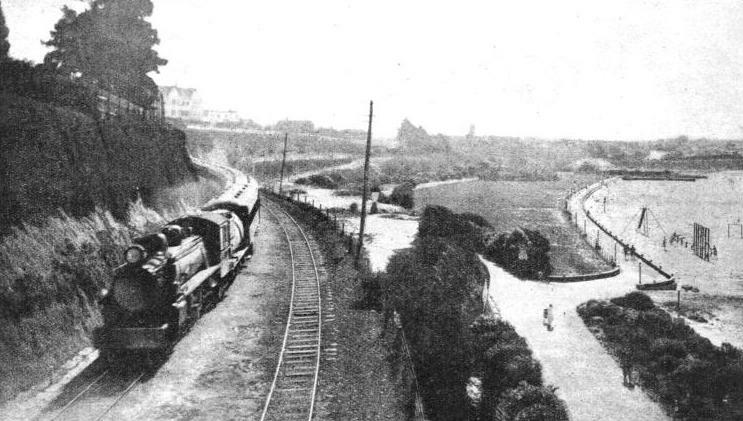 THE CHRISTCHURCH-INVERCARGILL EXPRESS passing Caroline Bay, Timaru, on the South Island Main Trunk Line, New Zealand. The principal system on the island connects the cities of Christchurch, Dunedin and Invercargill, and the fastest running is between the former two towns. The distance of 226 miles between Christchurch and Dunedin is accomplished by the best train in seven hours forty-three minutes. You can read more on “Engineering in New Zealand - 1” and “Electrification Overseas” on this website. You can read more on “The British Empire’s Longest Tunnel” in Wonders of World Engineering.